MOSCOW (Sputnik) - Moscow hopes Turkey will return Afrin under the Syrian government control, Russian Foreign Minister Sergei Lavrov said Monday. "[Turkish] President [Recep Tayyip] Erdogan has never said that Turkey wants to occupy Afrin. We always proceed from the fact that the easiest way to normalize the situation in Afrin now that Turkish representatives say that the main goals they set there have been achieved would be to return the territory under the control of the Syrian government," Lavrov said. 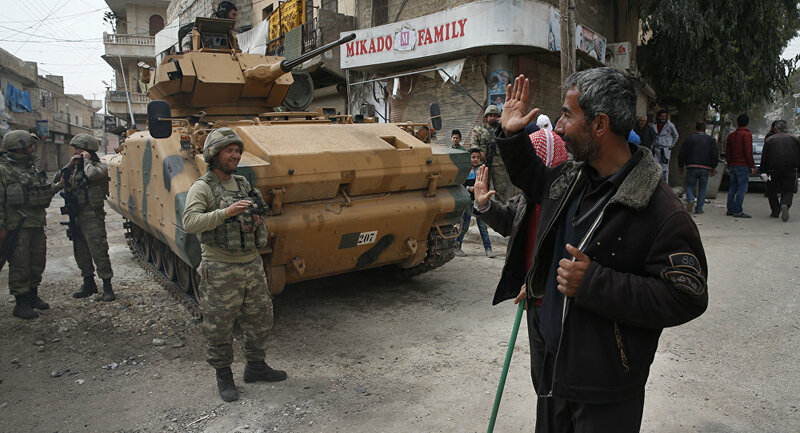 Ankara, jointly with opposition Free Syrian Army forces, launched Operation Olive Branch on January 20, entering the Syrian region of Afrin, which is predominantly populated by Kurds. Ankara claims it wants to "clear" Turkey's border from the "terrorist" threat: Turkey sees de facto autonomous Kurdish regions of Syria as controlled by terrorists and is especially wary of Kurdish held regions to the west of the Euphrates River. These actions have been strongly condemned by Damascus, which calls Turkey's move "a violation of the country's sovereignty." However, Ankara has stated that preservation of the territorial integrity of Syria is the common goal of Ankara and Damascus and that Turkish troops are not going to attack government forces in Syria. After Afrin: How Far East Will Erdogan Go?